This week I started at the British Antarctic Survey in Cambridge. I met the communications team I'll be working with as well as many others who look after the stations down in Antarctica. Everyone is very welcoming and keen to share their stories of Antarctica. Following introductions we got down to the training schedule and it's a fully packed next couple of months with various communications courses and flight following training. Then there is the BAS conference; where all those going down south get together for briefings and safety training plus the chance to socialise. As part of the induction I was given a tour of the ice core lab and aquarium on site. It was fascinating to see the science first hand, as well as discuss the what is carried out in the Antarctic. The range of research is vast. It was also interesting to learn about the challenges of transporting various samples back to the UK, it's definitely an engineering challenge. Next up was getting familiar with the various procedures and equipment used down on the stations. Luckily I've had last years Halley winter communications manager to show me the ropes. We first took a look at the HF radios, key to communication with aircraft and field parties, as well as other stations when required. The radios we set up are heavy and rugged, but they need to be for the extreme conditions they are used in. For those interested in radio, you need to get the dipole just the right length or the SWR is through the roof, even with the ATU. Next up is the satellite based communications providing easy to use devices that can be used for phone calls and data. 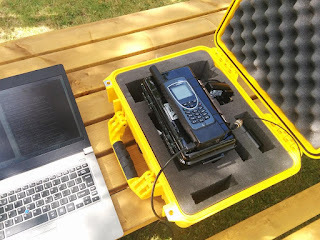 Finally we tested a VHF repeater which is used to provide radio coverage across stations where handhelds alone don't have the range required. 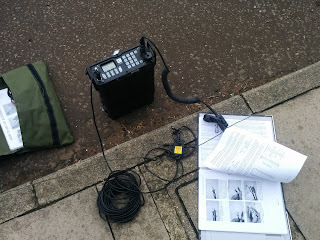 It was good to put some of the radio theory I've learnt in to practice. Before I left for the weekend I managed to chat to the current Halley winter station leader, Tom. On a surprisingly good phone line, we chatted about their current maintenance and what they have been up to over the last week. 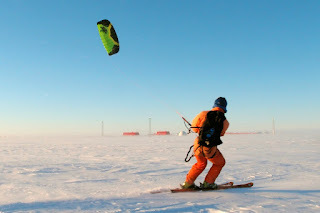 We also chatted about kite skiing and what kite to take down, I hope to get myself a kite before I head south.